Like most tourists, a young family from England reached here kalimpong yesterday answering the call of the mountain, but unlike others, the Snaiths travelled across six continents, mostly by road, to reach here. Steven Snaith, his wife Gillian, and their daughters Alisha and Lucy began their journey on a customised truck, fitted with a kitchen and a washroom, from Halifax in Canada in the summer of 2013. They entered Manipur in India via Myammar a little over a week back. The family reached here yesterday and will leave for Sikkim tomorrow for their two to three months stay in India. "We are driving around the world. We have been living in the vehicle for three-and-a-half years and are now on our way back to England. We crossed into India in Manipur from Myanmar. Now, we want to spend two or three months in India before continuing our journey. We won't see all of India. It is impossible in a life time, and certainly not in two or three months. The reason to come to Kalimpong was to see the Himalayas. We are going to Nepal afterwards," Snaith told The Telegraph. Snaith , 51, used to work for an accounting firm in eastern Europe and Gillian, 42, was a secondary science teacher before they took a sabbatical from their work and embarked on the world tour with their family. Their daughters Alisha and Lucy are 11 and eight, respectively. 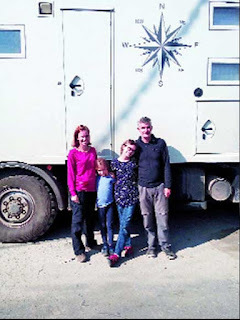 After customising the truck, the Snaiths shipped their would-be home for three-and-a-half years to Canada from where they started the overland trip. After criss-crossing the north and south Americas, the truck was shipped to Africa. The family started the Asian trip after visiting Australia. "Me and my wife met while travelling in Africa. We have undertaken many short trips, but we always wanted to do a big trip to see the world...We had planned (this trip) before our children were born," he said when asked the reason for the family embarking on such a long tour. The Snaiths are not unduly worried about the education of their daughters, given that they have not attended any formal school during the three-and-a-half years the family has been on road. "My wife is a teacher. That is her job. As we have been travelling for three-and-a-half years, she teaches them at home. She teaches them every day for a few hours. And then they learn a lot while travelling," he said with a smile.